With the release of Pillars of Eternity only a couple of weeks away, Obsidian has released a brief teaser from the "Making Of" documentary that was offered as a reward to Kickstarter backers. The seven minute segment reveals that things were very grim at the studio prior to the crowdfunding success of Project Eternity, after the cancellation of a console project that was in the works forced layoffs and led to talk of shutting down entirely. "As the months went by after that cancellation and we still didn't get a project, it got worse and worse and worse," Executive Producer and Lead Programmer Adam Brennecke says in the video. "And we kind of had a date in mind where we're like, 'If we pass this date [without a new project] then we're basically screwed.' We were basically going to run out of money." Brennecke, Chris Avellone, and a few others discussed the idea of a Kickstarter, but the proposal didn't really gain traction until Double Fine hit it big with Broken Age. 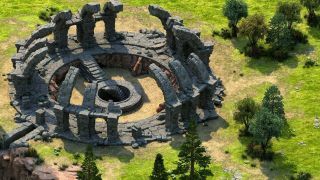 That success very quickly made crowdfunding seem like a viable option, and of course it was: The Pillars of Eternity Kickstarter pulled in nearly $4 million in 2012 on a $1.1 million goal. Obsidian announced in January that it will be out on March 26.